Here is our new toy, a hand held scanner. We just slid it over the pictures and you can see the results. Not too bad. We’re testing it out in preparation for use on our upcoming trip to France. 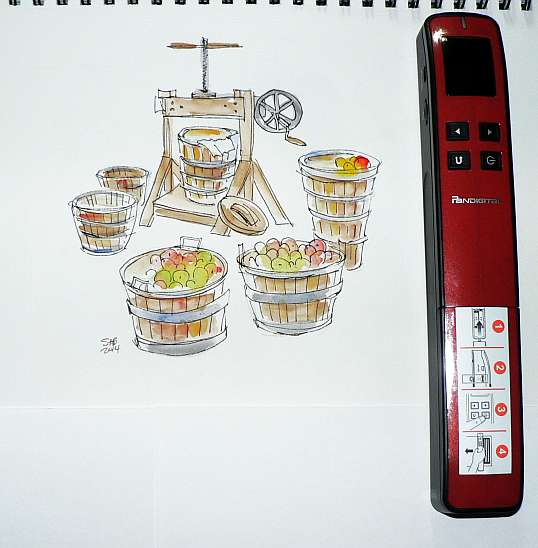 It doesn’t produce quite the quality we get from the flatbed scanner at home (especially the background shade), but it should be great for blog or Facebook postings of some of the drawings that will be filling up the sketchbooks I just bought. The New Hampshire images that follow were indeed scanned with this tiny device. 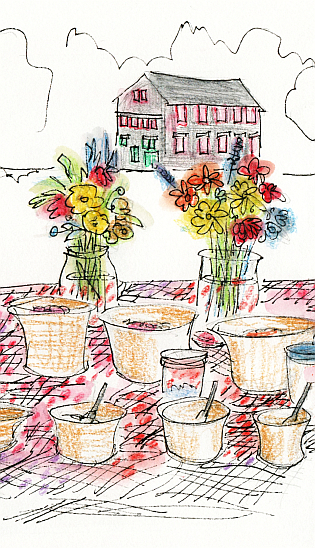 Some days my drawings are rather bright. On a very gloomy day at this month’s sketch crawl of the Second Saturday Sketchers in Sunapee Harbor, NH, I sketched this hydrangea bush. I believe that it is a bumper year for hydrangeas, if one can say that about flowers instead of edibles. The dangerous bump is a tree root pushing up the paving. And now to a softer palette. 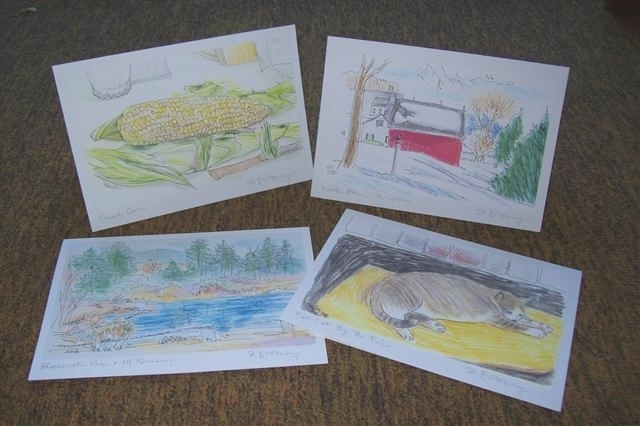 This drawing of the herb drying rack, and the other New Hampshire drawings below, were done this past Saturday on location at the Harvest Festival at the Enfield Shaker Museum in nearby Enfield, NH. Shakers were a branch of the religious sect the Quakers. They began in England in the 18th century. 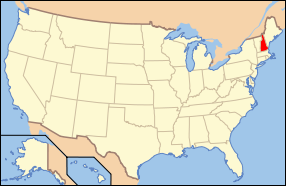 And they flourished with twenty communities on the east coast of the U.S. in the 19th century. To quote the Enfield Shaker Museum website, “They practiced equality of the sexes and races, celibacy, pacifism, and communal ownership.” The celibacy clause eventually led to their demise. 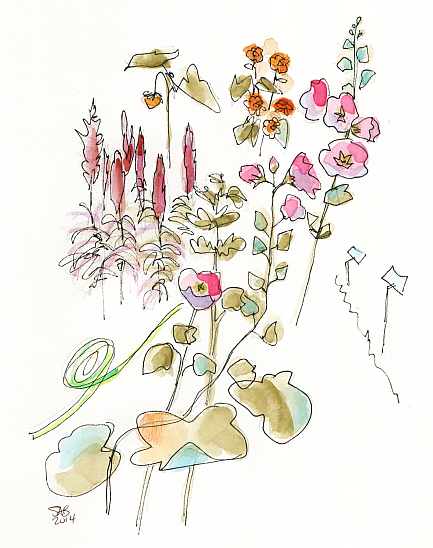 The sun warmed me while I sketched the pink hollyhocks, various sunflowers, and spiky red plants that I can’t identify. The Shakers were skilled gardeners and were the first folks, it is said, to sell seeds in little paper envelopes. Next up, we stepped inside a wooden clapboarded building where the Museum’s curator was making barrels. The materials varied depending on the client’s wishes and the intended use of the barrel. The ones above that look to be bound together in rope are in fact wrapped in split sapling strips. 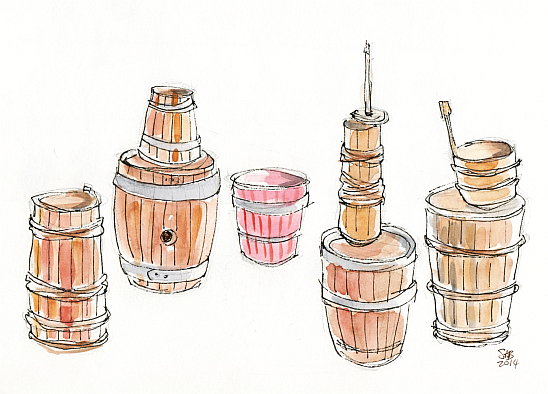 These worked fine for barrels containing contents of relatively low weight and exerting relatively low pressure. And were cheap. Barrels used for beer (high pressure) and graphite for the pencil factories (heavy) required metal bands. One activity station at this festival offered a chance to make pot pourri sachets. 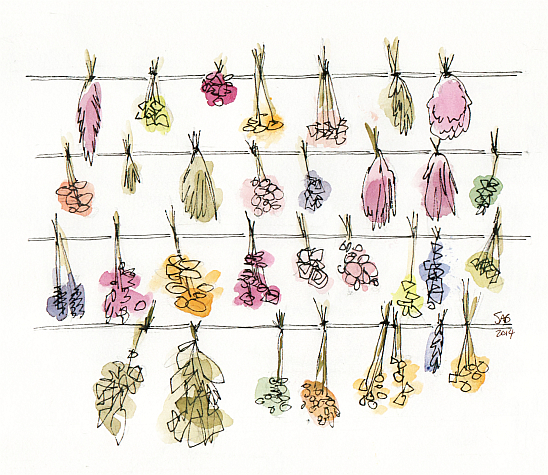 The dried flower petals and herbs were grown in the garden. I was ably guided by a Girl Scout who sure knew her pot pourri. An old granite stone mill is in the background. 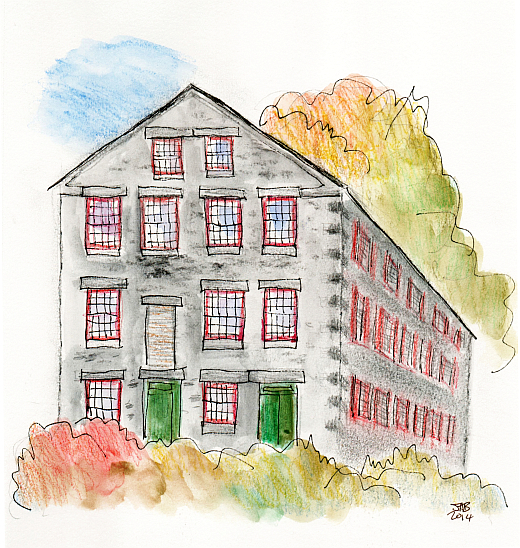 The Stone Mill building from 1849 sits atop a hill across the road from the main living quarters of the Shaker community. It houses three stories of water powered machinery. I have never been inside. I, of course, like the red painted window trim. 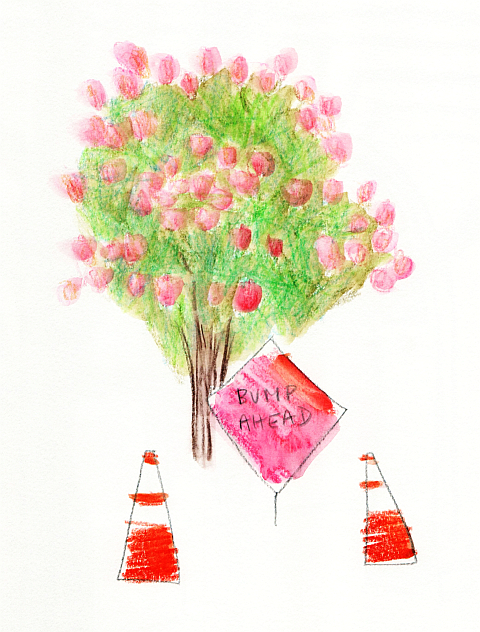 The machine above is an apple chopper. The fruit is chopped before moving it to a press to make cider. Delicious samples were available for tasting. 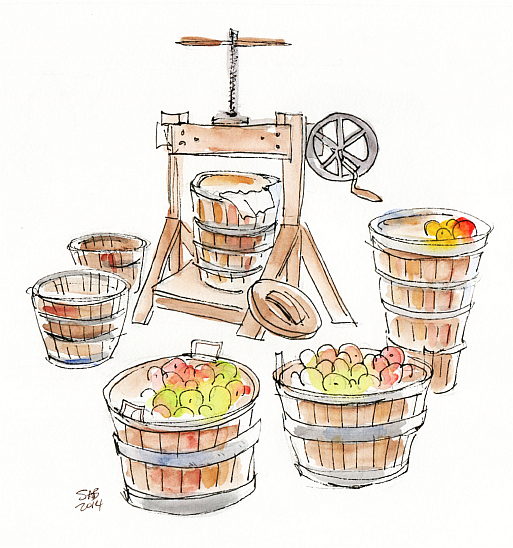 Other demonstrations at the festival included butter churning and the making of apple cider ice cream. The ice cream had been all consumed by the time we got there. The Shakers believed in hard work, making money selling things out in ‘the world’, and inventing clever machines to speed along the hard work. Enough of New Hampshire for now. 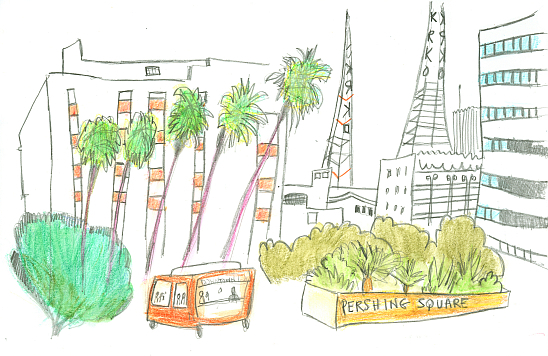 Back to my collection of drawings of Downtown Los Angeles. 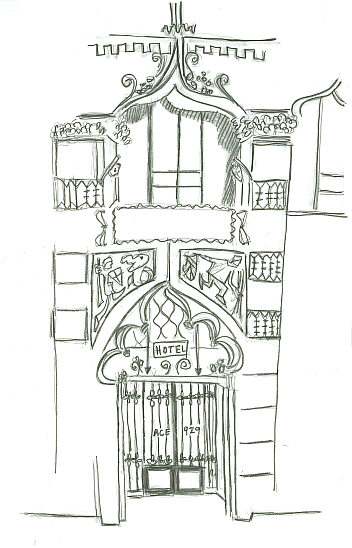 Above is the front door to the Ace Hotel, 929 Broadway, sited next to the United Artists Theater. There were a ton of biblical and ecclesiastical references. In the panels above the door, I saw, after a lot of squinting, St.George slaying the dragon. And another guy using his weapon to cut wheat. Or something like that. The theater is designed to look like a Gothic church. I wonder what the inside looks like. 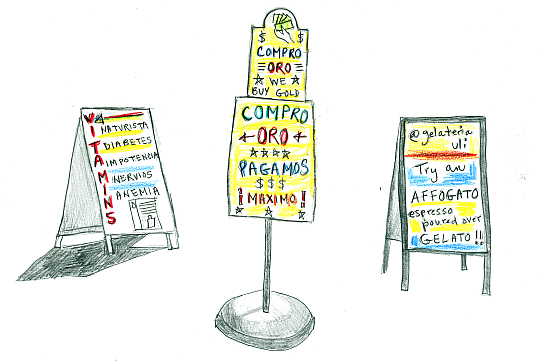 You may have guessed that I especially love small sidewalk signs, even if my lettering skills are not A+. I believe it is obvious that these signs are meant for two distinct groups of people living in DTLA. One more California image for this time. Here is a street view in the Arts District. You can see the tall buildings of the Financial District which is very helpful for orienting yourself. Meaning that I could always find my way back home to our daughter’s apartment. I was up way too early in the morning for most denizens of the Arts District. (My body was still on East Coast Time.) Only a few sleepy dog owners shuffled past. See all the murals, including the enormous face? 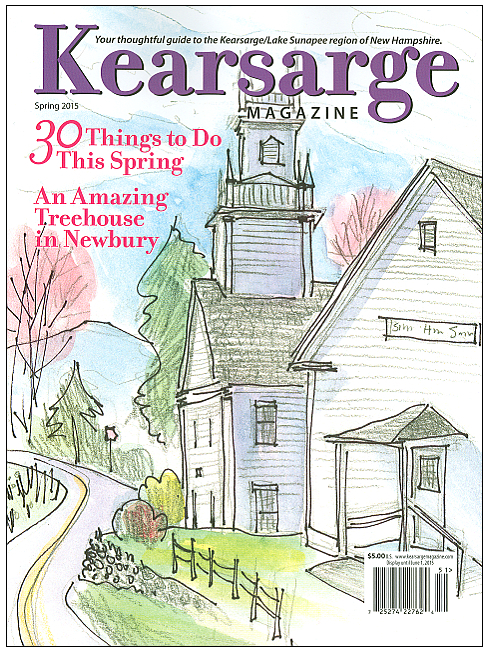 Local artists - Join us for the monthly Second Saturday Sketch Crawl at Sunapee Harbor, September 13th from 9 (or thereabouts) to noon. So it’s back to sunny southern California to draw again. I started a project in the spring and finished it this summer. 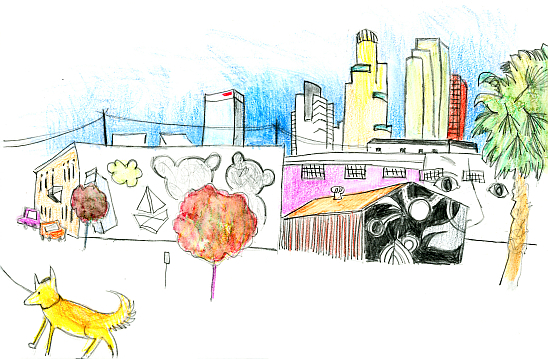 The project was to draw on location in Downtown Los Angeles. 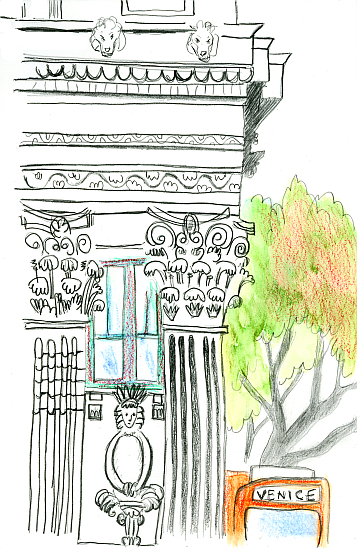 Our daughter and her husband moved here last year, and we’ve been captivated by the beautiful historic architecture and the vibrancy of the area. 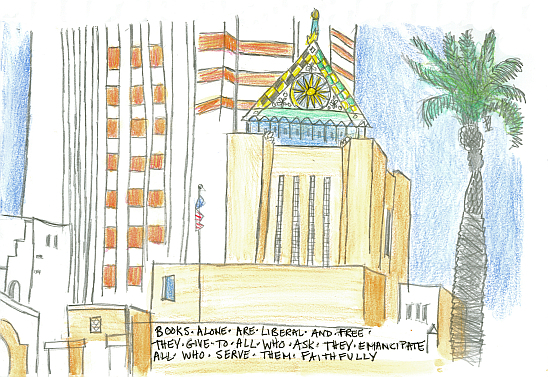 I thought a total of 50 drawings would tell the story of this fascinating part of the city called DTLA. Here are a few, and you can see them all in an upcoming book. My first day, I left the apartment very early...still on East Coast time. I sat on a stool at the Starbucks around the corner at 6th and Spring Street. And this was my view. The building was probably once a bank. The morning sun caught all the details of the Corinthium style columns. You can take that orange bus all the way to Venice, Venice Beach that is. By turning my head about 90 degrees at the coffee shop, I got this view. DTLA is full of murals, mostly of very large faces. The painting is on the side of a renovated building full of loft apartments for the young professionals who are flocking to the area. I always felt a little unnerved by this huge face peering in. Pershing Square is a mixed use park a few blocks from our daughter and son-in-law’s apartment. It is surrounded by Beaux Arts and Art Deco buildings. The time frame for them is the 1920s and 1930s. In this drawing I was more interested in the antennas for KRKO. Being a northerner means I don’t understand palm trees, but they appeal to me as a pattern. Still on my first day in LA, I climbed halfway up the Bunker Hill steps to get this view of the City Library tower. It is dwarfed by taller buildings now, but lovely in its Art Deco style. The top pyramid is covered in colored and gold mosaics that glint in the sun. I am still trying to understand all the different kinds of palm trees. This is not Downtown Los Angeles, but it includes an iconic view that is sometimes visible from the downtown. 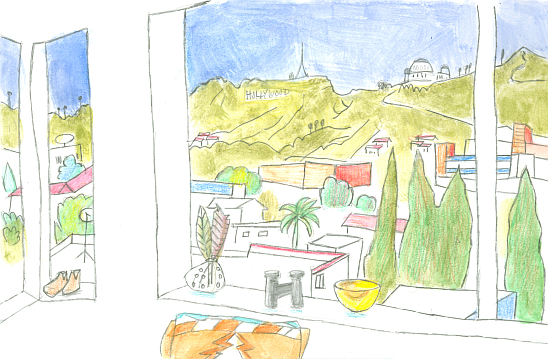 In the center background is the famous Hollywood sign, and to the right of that is the Griffith Park Observatory. 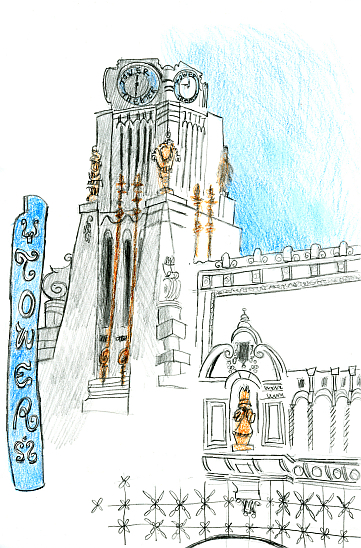 The Tower Theater at Broadway and 8th. The many theaters on Broadway have Art Deco motifs all mixed in with Mexican/Aztec/Central American ones. This one is all terra cotta and glazed tiles. Most of the theaters have been well preserved, and while not open for regular operation often serve as the venue for receptions, award presentations, TV and movie shoots, and the like. It was hot as blazes while I squinted up at this white building and then down at my white paper. 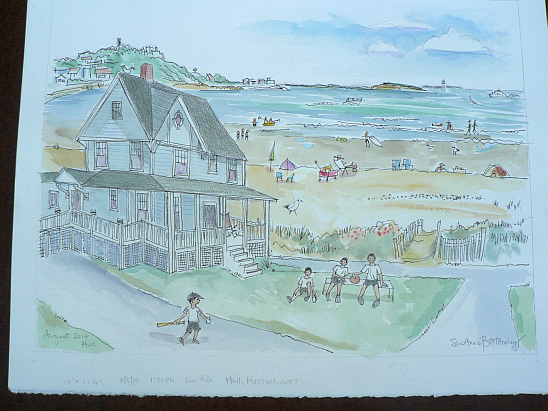 Last month I was asked to go to the South Shore of Boston to the beach town of Hull. 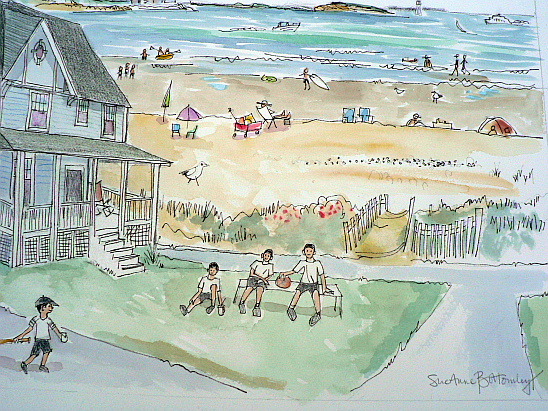 My commission was to draw/paint the 100 year old house and the beach, and to include four young brothers who weren’t there at the time. Timing was very tight between the day I painted this and delivery (the client’s wife’s birthday), and so there was no time for a professional photograph of the finished piece. So I have this very bluish image of white paper to post here. There are all sorts of crazy perspectives going on here. My goal was to feel as if I were walking over the dunes and seeing the whole horizon open up. 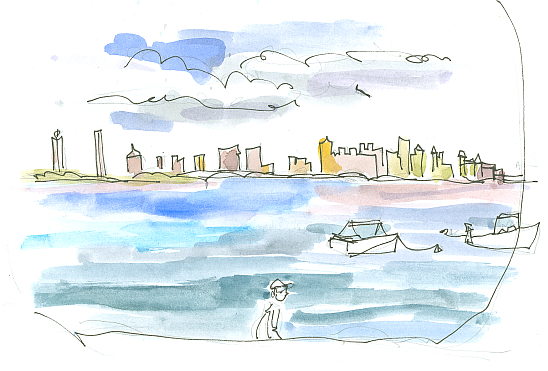 I sat on the bee-yoo-tee-ful beach for an hour and a half studying all the colors, the boats and ferries, all the people and their beach toys, even moving the land forms into a better composition. I took photos of the house to help me work on the details at home. The four boys also had to be done at home from a compilation of a handful of photos provided by the client. 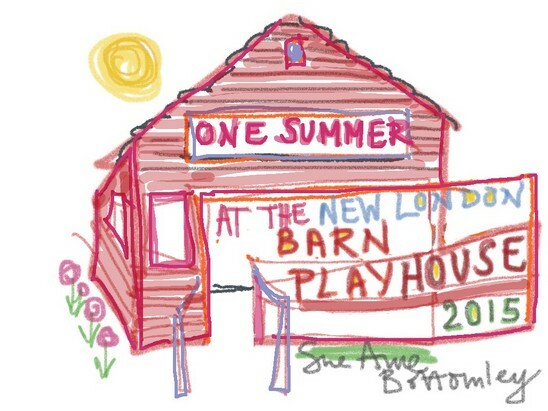 In the photos, the boys were all on the porch, so you can see that I had to make major modifications. It was all a secret as these things usually are. And I was told that it was a big hit. And here’s a nicer exposure of a closeup of the beach and the boys. And while we were in Hull I drew this carousel, the last remaining relic of Paragon Park, the old Nantasket Beach amusement park. It was also a request from the same client. 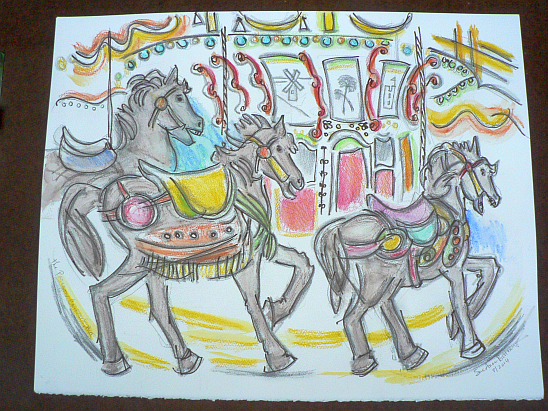 To add to the challenge, I drew the horses as they were spinning around. Fun. I love carousels. The carousel has been housed in its own building and lovingly preserved by a non-profit organization. It’s still fully functional. Individual horses are sponsored by generous donors, either annually or in perpetuity. And on the way home from Hull the road to Boston unexpectedly turned left, we continued straight, and we ended up on Hough’s Neck, a short peninsula in Quincy with this view of the Boston skyline. I didn’t even get out of the car, and I had it down on paper in minutes, including part of the car’s windshield. You see an airplane heading right into Logan Airport. It is one of those exciting and scary airports nearly surrounded by water. 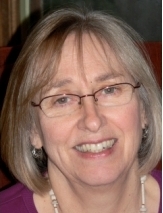 Last week was our wedding anniversary. For the second year in a row, we had a very nice brunch at Lakeside Grille at Church Landing in Meredith, NH. 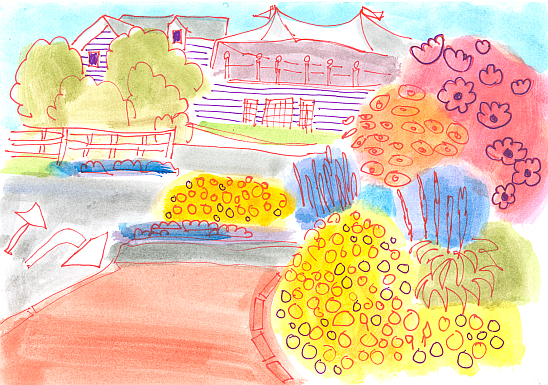 On our walk afterwards, I drew some end-of-summer lush gardens. 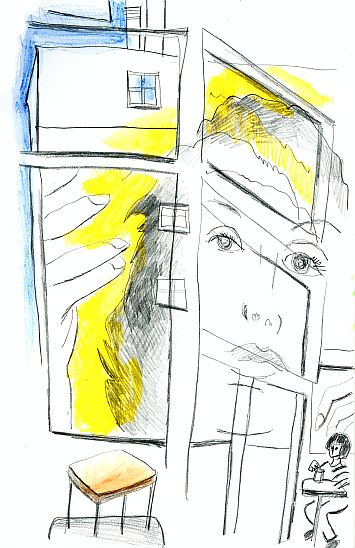 I was purposely emulating another artist’s style here, Reuven Dattner from Israel. I don’t know him. He posts online daily, and I enjoy following his work. It was very entertaining to draw with red and purple gel pens. The watercolor was added at home.